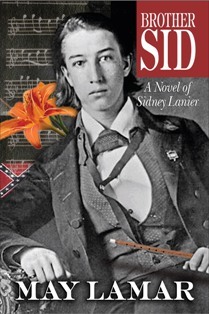 The author states on the flyleaf of this spirited first novel, “Brother Sid is a work of fiction primarily based on letters to and from Macon [Georgia]-born artist Sidney Lanier.” The protagonist is the 19th century poet whose real life fame is legendary in Montgomery, Alabama, where a prominent high school memorializes his name. The jacket cover art combines a photograph of the subject with his flute, musical notation, and other colorful symbols of his life, such as a tiger lily (which, capitalized, is the title of his novel), and a Confederate flag. Except for the Prologue and Afterword, the chapters are numbered and interestingly (and rather contemporarily) arranged to convey the life story in juxtaposed order. Julia Oliver is a writer in Montgomery.